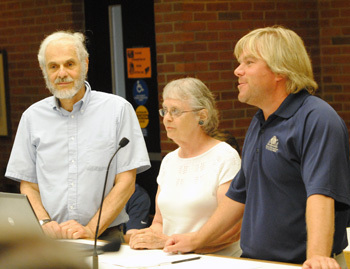 Ann Arbor park advisory commission meeting (June 21, 2011): Park commissioners heard some unusual and welcome news at their June meeting – two long-time Ann Arbor residents, Leslie and Michael Morris, are donating $50,000 to the city in support of South University Park. From left: Michael Morris and Leslie Morris, who are donating $50,000 to rehab South University Park, and Colin Smith, the city's parks and recreation manager. In brief remarks to commissioners, Leslie Morris – a former Ward 2 city councilmember – explained how she and her husband had played a role decades ago in creating the park, which is located at South University Avenue and Walnut. They hope their donation will help develop the park based on current needs of the neighborhood, she said. Later in the meeting, commissioners got updates on the Ann Arbor senior center and Mack pool. Both facilities rely on general fund support and had been at risk of closing, when city officials were looking to cut costs in 2009. Residents rallied, and the city formed two task forces to develop strategies – both for raising revenues and cutting expenses – to keep both facilities open. The reports given at PAC’s June 21 meeting were updates for the first fiscal year that these strategies took effect. Neither facility completely hit its target budget goals, but each took steps toward closing the gap between revenues and expenses. Commissioners also got a quarterly update on capital improvements in the park system, including plans to renovate the Island Park Greek Revival shelter and the pergola at West Park, and to replace a path at Leslie Science & Nature Center – a project that might use recycled crushed glass as a porous surface. PAC members voted to recommend approval for funding of two specific projects: renovation of locker rooms at Veterans Memorial Park, and of tennis courts at West Park. Al Taubman, a major donor to the University of Michigan over the years, has committed another $56 million to fund medical research at UM – completing a gift of $100 million to the university for that purpose. This gift will support work at the Taubman Medical Research Institute. UM president Mary Sue Coleman announced the news at the April 21, 2011 regents meeting. Regents later approved the renaming of the biomedical science research building in honor of Taubman. The gift brings the total of Taubman’s donations to UM to $141 million – he is the largest single donor to the university. His other gifts have supported the Taubman College for Architecture & Urban Planning, the UM Museum of Art, and the office of financial aid, among others. A Place for Petanque in Ann Arbor? “Oooh, shiny!” exclaimed Howard Ando and Jane Wilkinson when we unveiled our set of six petanque boules, scarcely used over a decade since they were purchased. Petanque boules (shiny metal) bracket the cochonnet, or jack, on Howard Ando and Jane Wilkinson's court. 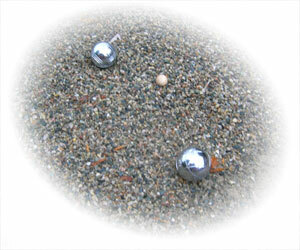 The couple’s own set of metal boules were dull with the wear of frequent play on the gravel surface typical for petanque. Over the last two years, much of that play has come on the rectangle of gravel in the side yard of the couple’s Ypsilanti home, just west of the Eastern Michigan University campus.